The platform can be equipped with an in-cabin emergency manoeuver device that is automatically activated in the event of a power black-out. It returns the cabin back to loading deck level. LEA is classified Class A (according to VDI 4707 standards), its consumption does not affect normal daily routines and it allows considerable savings. LEA is also a low impact product. Thanks to its low consumption, LEA can be used with other household appliances without having to increase power supply. Standard electrical power supply used in private dwellings or available in common electricity meter in condominiums’ stairwells is sufficient to power the lift. 3 Kw are more than enough. 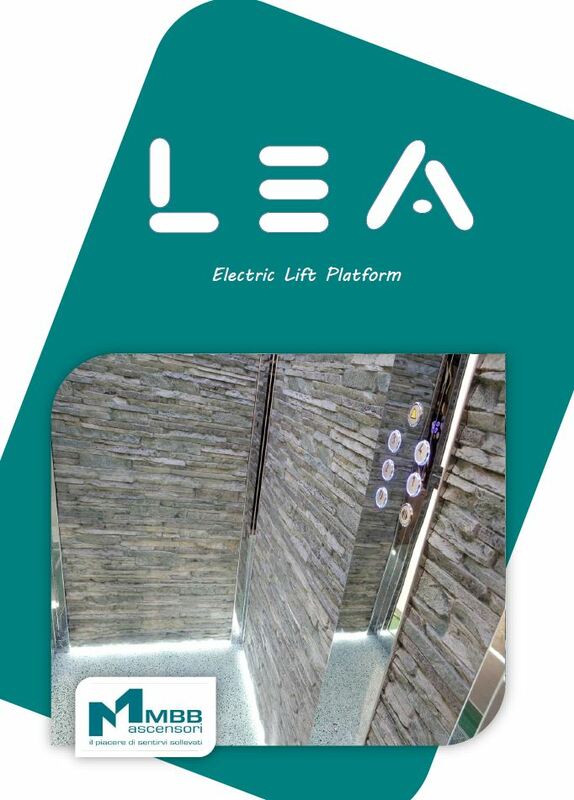 Designed to be quick and easy to install the LEA platform is economically competitive. Assembly requires only a few simple components. The LEA platform was designed to guarantee maximum comfort during its operation. It is equipped with a soft stop and go system that provides extremely quiet operation. LEA positions the motor unit in the column head directly anchored to the lintel and counterweight guides, inside the hoist way. This eliminates the need for additional space to house hydraulic power units and control panels1, allowing installation even in the smallest of spaces.